Business leaders cannot ignore what’s going on around them and survive. If you live in an ivory tower, you’ll fail. It’s that simple. Keeping yourself too detached from the essential give and take of your business is a recipe for disaster. Delegation of the day-to-day operations does make sense at a certain level. You put a talented, dedicated management team in place, and it would be a mistake for the organization — and a slap at the people you’ve entrusted to execute your mission at the highest levels — not to let them do their jobs and reach their individual potential. Realistically, it’s impossible to know every little detail of your enterprise, especially when you have 1,500 employees operating in more than 50 countries. But that doesn’t mean you shouldn’t immerse yourself in the most important aspects of business and performance. Show me a leader who doesn’t have dirty fingernails, and I’ll show someone who probably won’t be in the job very long. You have to thoroughly understand what’s going on — the deals you’re making or considering, deployment of your business model, customer satisfaction, and performance of the leadership team and sales staff. My approach to oversight may be aggressive at times, but it’s vital. It’s also part of my nature; I don’t think I could change it even if I wanted to, which I don’t. Dan McCarthy likes to say, “Irv is built for speed, not for comfort.” I think that’s an apt description. There’s just no substitute for diving into the key details yourself. Sounds overly simple, but I’m constantly amazed at how little some executives seem to know about what’s really going on in the trenches. Not me. I want and need to know the important details, especially when it comes to hearing and absorbing bad news, what we’re going to do about our problem children, and assessing any negative fluctuations in the business. To avoid falling out of touch with these pivotal areas, you need to establish some type of review cadence. Accountability is crucial. Check-in meetings must be on the calendar regularly. Be consistent when it comes to these meetings and what you hope to accomplish. At Hewlett-Packard Financial Services, we always use a template so that all the participants know exactly what will be covered and can prepare accordingly. I have regularly calendared meetings with my direct reports — my senior leadership team — individually several times a month. We always know the topic of discussion in advance, and I expect us to stick to the program. That said, we leave time for ad hoc subjects, and my team knows I’m otherwise available to them 24/7. That’s a guiding principle any chief executive must embrace; be available, even if it interferes with other considerations, work or play. Our CFO and I review the performance of the business units monthly, but there’s always a forecast due or an interim result to consider. We often go deep into identifying and charting those elements that drive our key results. Those are the scheduled meetings, anyway. He and I are likely to talk far more frequently about the financial state of the business in a more informal setting. A day when we’re not in each other’s offices four or five times is rare. I wouldn’t have it any other way. It’s an interesting line you must walk as a manager. Too much hands on and you’re micromanaging; too little, and you could find yourself leafing through the want ads. I purposely don’t chair any of our internal governance committees — credit, pricing, expansion, and so forth. But I am an active member of all of them and am careful to be the last to discuss the issues and cast my vote. Of course, I have absolute veto power, as any engaged CEO should, but I try to use it sparingly if at all. We’ve created a system of clear-cut rules about quorums. I trust my team. If I can’t make a meeting, decisions still get made. But it’s up to me to make sure I get the homework afterward. We’re in a fluid, fast-paced business. For all the attention to personnel and operational processes, I’m an absolute bugger when it comes to the business plan. To me, it’s probably most the important management tool. When I was CFO of AT&T Capital, my oft-used expression was “the business plan is inviolate.” I still believe that, maybe even more now. We really put the organization through its paces when it comes to creating the plan. Our job as leaders is to grow the company; does the business plan have the requisite amount of stretch? If leaders have a plan that is too ambitious and likely to set up their team, as well as themselves, for failure, you need to recognize that, too, and be able to dial them back. Typically, the staff is more interested in submitting what I like to call a rocking chair plan. That is, they can deliver it while relaxing. That won’t do, and it’s when I really kick into high gear. Testing their assumptions, challenging their conservative approaches, casting light on the deficiencies in their rationales—that’s the responsibility of a leader who understands that growing the business means growing the business, not settling for complacency and less-than-optimal results. To me, plans that are too long-range are cause for skepticism. But I do believe in setting long-term business objectives and developing a framework for the trajectory we need to get there. Remember this — a plan that extends out a year or two is more reliable. What’s critically important is that the strategy and resultant plan match up seamlessly. Growth rates, operating ratios, and the “drop” — are you growing revenue by 10 percent but the bottom line only by 5 percent? Something’s wrong! All of those elements must align to produce a high-quality, executable plan. Our team tracks achievement against plan. We scrupulously manage by and measure against the plan we’ve built—think back to those review sessions I mentioned earlier. If you’re an executive working for me and you’re falling behind plan, you’d better come prepared with defensible remedies. On the flip side, if you’re ahead of the plan, assess what’s working well, what got you to that point, and make sure we can sustain or even build upon it. It isn’t as though these are formal gatherings. They’re working sessions, with critiques, a healthy back and forth. We have a format, and we walk through it. I can’t know every little thing that goes on in the business, but I know what I have to know. And I’m always ready to roll up my sleeves. I’m willing to get my fingernails dirty. The bottom line is this: know what’s going on. What are the expectations you’ve set for your people? Are they meeting those expectations? You have to operate with a model everyone can understand and apply. I want people who want the same things I want. You’ve got to want to grow the business. It’s about ambitious targets, it’s about stretch. You cannot work for me if good enough is good enough. We want to be world class; we want to be top dog. We don’t have to step all over people to get there. But if you’re not willing to extend yourself and take some risk, to stick your neck out, you may fall short. 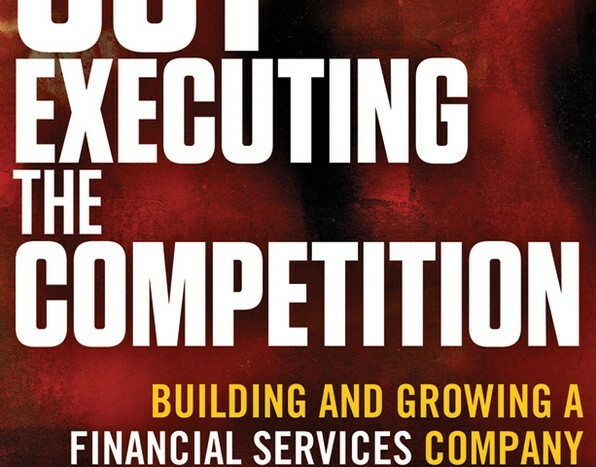 Excerpted with permission of the publisher, John Wiley & Sons, from Out-Executing the Competition: Building and Growing a Financial Services Company in Any Economy by Irv Rothman. Copyright © 2012 by Irv Rothman. All rights reserved. Available at all book sellers. Irv Rothman leads HP Financial Services, a wholly owned subsidiary of the Hewlett- Packard Company, where he is responsible for the worldwide delivery of customized leasing, financing and financial asset management solutions that simplify customers’ IT life cycle management and reduce their total cost of ownership. Prior to joining HP, Rothman was president and chief executive officer of Compaq Financial Services Corporation (CFS) from its founding in 1997, growing the business to more than $3.7 billion in total assets prior to the HP and Compaq merger. Contact him at JaredS@FinnPartners.com.